A crowd gathers at the scene of the shooting of Philando Castile by a St. Anthony Police officer in Falcon Heights, Minn. on July 6, 2016. Police pulled over Philando Castile, 32, for driving with what his girlfriend Diamond Reynolds described as a “busted tail light.” Reynolds said the officer asked to see Castile’s license and registration after the traffic stop, prompting Castile to reach for the documents. Castile told police he had a gun and was licensed to carry it, according to Reynolds. At some point, the police officer opened fire. Reynolds began streaming the incident to Facebook Live shortly after the shooting. In the video, Castile is seen with a bloody shirt and the police officer’s gun is seen through the window. Reynolds’ daughter is in the back seat of the car. Castile was pronounced dead less than an hour later at a nearby hospital. Castile was a cafeteria supervisor at a Montessori school where he had worked for more than a decade, according to a Minneapolis Star Tribune report. He grew up in St. Paul and also lived in Minneapolis. A cousin told the Star Tribune that Castile had been a straight-A student who graduated with honors from St. Paul Central High School. The officer who fired has not been identified. Police officials said he has been placed on paid administrative leave. The interim chief of the St. Anthony Police Department said the Minnesota Bureau of Criminal Apprehension is leading an investigation into the death. 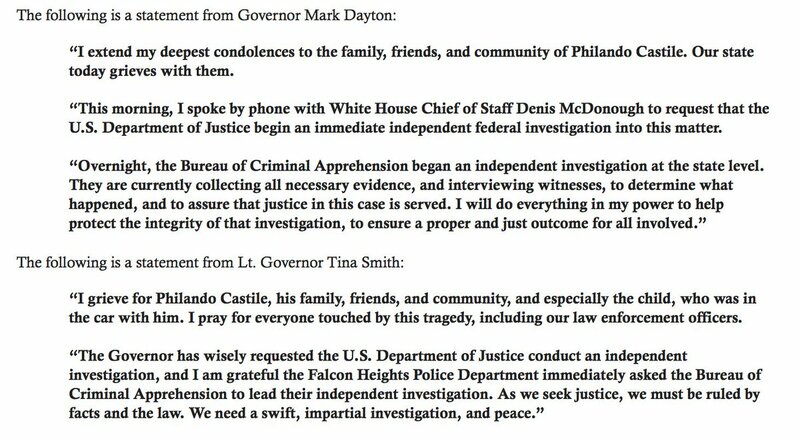 Minnesota Governor Mark Dayton said Thursday that he has asked the U.S. Department of Justice to launch an independent investigation. In the meantime, protesters have gathered in the state capital.